Roy Halladay’s 14 strikeout, 133 pitch performance last night was yet another example of his dominance over every other pitcher in the league. It was an example of why the Jays must re-sign him in the off-season and why he will most likely be the American League’s starting pitcher in the All-Star game and probably win his second Cy Young award. Bold predictions? Not really. Barring a cataclysmic occurrence of which I will not speak (kinda like Lord Voldemort), Halladay is the front runner for these accolades. I have never seen him in such dominant form, and that’s saying something. Every five days you get the feeling you can’t lose. Before the season started, when almost everyone was predicting a gloomy season for the Jays, I mentioned that if these dire predictions rang true at least we would get to see a masterful performance every five days. It turns out these performances are the gravy on our mash potatoes, and they’re occuring in Toronto (take that Billy Bob). The mash potatoes are the fact that it’s June and the Jays are still deeply involved in the divisional race. 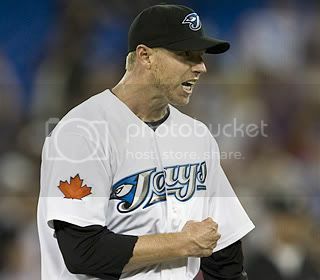 I only caught the end of the game last night (Gargoyle duty), but what I saw will remain imprinted on my brain for a long time: a clearly winded Halladay, taking a seat between the eighth and ninth innings, having thrown over 115 pitches, Cito taking a seat next to him and having a chat with him. At one point they both nodded and started chuckling. I’d love to know what Cito said to him, because it’s the first time I’ve ever seen Halladay smile during a game. He then trotted out to the mound, looking a little sluggish but deadly as always. I hope there are additional indelible images coming our way this season, but that was the second one (the first being the Travis Snider bomb at the Metrodome). JP, sign this man in the offseason. Rogers, do what must be done to retain his services. Step number one would be to show a willingness to go out and improve the team, and Sager over at Out of Left Field has a nice wishlist.